Cell division plays a critical role in the life of the organism, including such essential functions as reproduction, growth, and development, as well as the renewal and repair of worn out or damaged cells. Many anticancer drugs act by disrupting specific phases of the cell cycle. The cell cycle is a continuous process that results in the formation of two daughter cells that arise from a single dividing parent cell. There are two major parts of the cell cycle (aka cell division cycle): interphase and mitotic phase. While in interphase, the cell grows and chromosomes are replicated, which alternates with the mitotic phase, during which mitosis (nuclear division) and cytokinesis (cell division) occur. The interphase, which consumes all but one to two hours of a twenty-four-hour cell cycle, has three phases: G1, S, and G2. 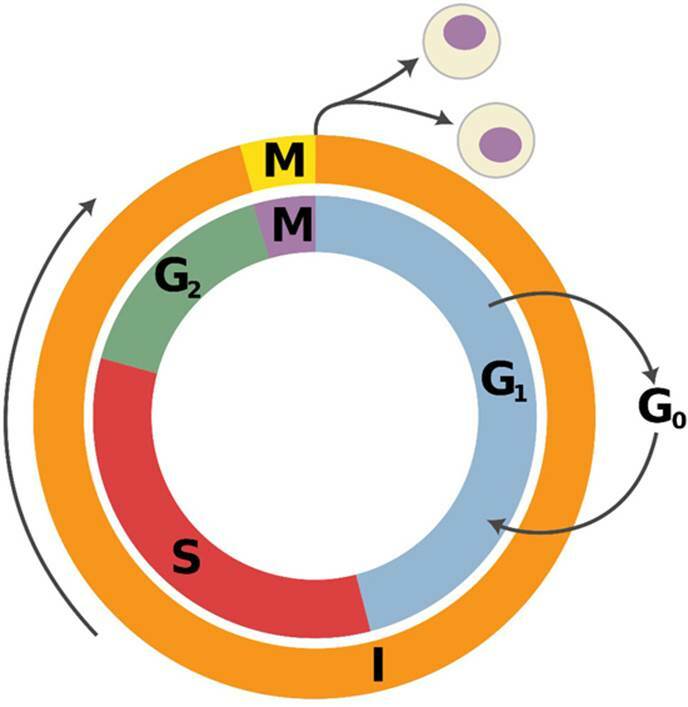 G1 and G2 are gaps between the end of cell division in the mitotic phase, during which time the environment is assessed for errors prior to moving to the next step. Starting in about 1970, checkpoint mechanisms at the gaps were identified that review the environment to ensure that the preceding step in the cell cycle has been completed or corrected. If so, the “go” signal is given, and the DNA is replicated in the S phase. The “go” signal involves the proteins cyclin and a cyclin-dependent kinase (Cdks). If conditions are not right, corrections are made or the cell is destroyed; an incorrectly divided cell may result in cancer. In 1991, the Nobel Prize was awarded to Paul Nurse, Leland Hartwell, and R. Timothy Hunt for their discovery of these protein molecule checkpoints that regulate cell division in the cell cycle. At the conclusion of the cell cycle, the parent cell has doubled in size, the chromosomes have doubled in number, and the cell has divided in half, forming two genetically identical daughter cells to reinitiate the cycle. Cell cycles vary from ten to twenty-four hours in rapidly growing intestinal cells, to once annually in liver cells, to never for mature nerve or muscle cells. SEE ALSO: Cell Theory (1838), Meiosis (1876), Mitosis (1882), DNA as Carrier of Genetic Information (1944). This illustration depicts the cell division cycle. During the interphase (I), which consists of three phases (G1, S, G2), the cell grows and chromosomes are replicated. At the mitotic phase (M), representing 1–2 hours of the total 24-hour cycle, nuclear division (mitosis) and cell division occur.